The biggest little City in the World Reno Nevada has plenty of offerings for it’s visitors. 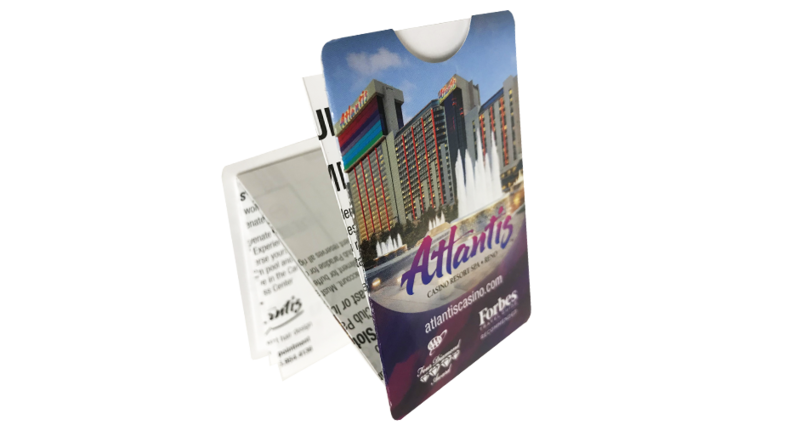 When the Atlantis Casino Resort Spa wants to inform their guests of the essentials, they use a Z-CARD® Check in guide to inform and deliver their room keys. Why does Atlantis use a Check in guide pocket map for their key packets and to show off their AAA four diamonds award rating? The revenue potential – These properties can cross sell amenities and promote restaurants and bars on property. Atlantis can generate more revenue by getting this information in their guests’ hands in a way they will happily hold onto and keep. The mapping – Check in guide pocket map is a fully folding poster joining 36 small book pages or individual screen spaces into a complete map display. This makes the Key packet and guide easy to use, open and fold. The sleeve and cover – Z-CARD® pocket maps are bound between two hard covers. One cover is a secure room key sleeve. All together this creates a small hardcover book. People never throw away books. They are valuable.